There are various cooling fans made up of substandard materials available on the market, and they are relatively inexpensive. However, they wouldn’t fit “fashionably” with the aesthetic of your MacBook Pro and may even end up breaking down after a few months or so (not to mention scratching your laptop big-time!). MadMINDS is offering something that appears infinitely better, smarter and cooler (no pun intended) with the TILT Cooling Stand. The TILT Cooling Stand is the first of its kind to be specifically engineered and styled for your 15” MacBook Pro’s aluminum unibody. It is made of ABS plastic that is so thin, sleek and simple that you wouldn’t even recognize it’s there cooling off your precious Apple notebook. It measures 0.6” thick and weighs merely 8 ounces. It is so thin that it can even fit in the slimmest of laptop cases. This MacBook Pro cooling fan is known for its cooling technology and multi functionality. It has a tiny wedge that locks easily at the bottom of your MacBook Pro while allowing air to flow freely underneath. It employs a MaxiGrip Mobility System that should keep your MacBook Pro safe from any scratches. And then, when you need to really cool things off, simply plug in the FLOWthru Cooling fan via USB for an added punch of air. What’s more is that this fan is quiet enough that it won’t distract you from your applications. Now if you are a DJ, a videographer or photographer who works hand in hand with your MacBook Pro, this USB gadget can just be your perfect partner. This is because the base of the case has a tripod screw hole that allows your MacBook Pro stand elevated. This USB cooling fan for your laptop is a Kickstarter project and the manufacturer only needs $8,000 to start production. Luckily for MadMINDS, the company has exceeded its pledge goal by more than $4,000 with more than a week left for fundraising. You can visit Kickstarter to pre-order then just make a $45 pledge to get one. Upon retail, the laptop USB cooling stand will be at $55. 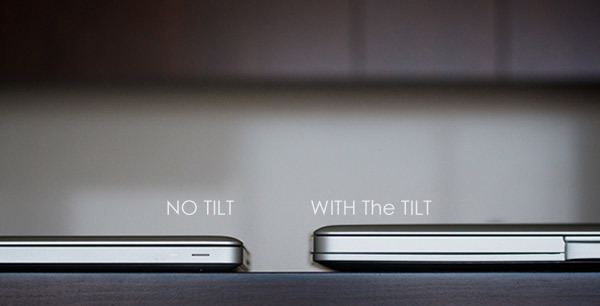 The TILT is available only for 15” MacBook Pro. A smaller version for the 13” MacBook Pro is still being developed. MadMINDS is looking to start the first round of production in December. The fundraising is needed for the tool required to produce the TILT Cooling fan out of high quality ABS and polycarbonate. With the TILT Cooling Stand, USB technology worms it way further into Apple users’ hearts. Will you be supporting the TILT USB cooling fan? Why or why not? Let us know what you think! This entry was posted in Apple, Articles, USB Gadgets, USB Technology and tagged MacBook Pro cooling fan, MadMINDS, Super Slim TILT Cooling Stand, TILT Cooling Stand, TILT MacBook Pro Cooling Stand, TILT MacBook Pro Cooling Stand USB, TILT USB Cooling Stand, USB gadget, USSB technology. Bookmark the permalink.